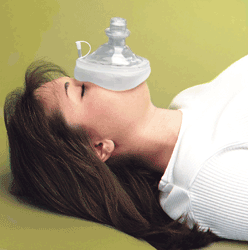 There are many options for CPR masks. We chose the MDI Micromask due to the inflatable and pliable cuff. This allows for a good seal in all temperatures, regardless of altitude. In the cold, the cuff remains pliable unlike most other masks. Since you can inflate the cuff of this mask it will not pop at altitude or while ascending in a helicopter. It also has an oxygen port which connects to standard oxygen tubing.